When you buy shares, you become a part-owner of a business. As a part-owner, you may receive a proportion of the profits in the form of dividends, and you’ll benefit from any growth in the share price. The share market is a place where people can buy and sell shares, and where companies can raise capital by issuing shares to investors. You can invest in shares directly, or via a managed investment or separately managed account. With a managed investment or separately managed account your investment manager will research the shares and then buy and sell on your behalf (as well as for all the other investors in that fund). If you choose to buy and sell the shares yourself, you have total control over your money and what you buy and sell. However, this means that you’ll need to research and manage those shares yourself (unless this is done for you by your financial adviser). The main reason people invest in the share market is because well-chosen shares have historically outperformed the other asset classes (such as property, cash, and fixed interest) over the long term. Your personal tax liability is then calculated after taking into account the tax that has already been paid by the company. The objective is to ensure that income is only taxed once. As a result, investors on the top marginal rate of 46.5% (including Medical Levy) pay little tax on ‘fully franked’ dividends, while investors on lower tax rates either pay no tax on the dividend or even qualify for a tax refund. Things you should consider Your financial adviser can give you a copy of the relevant Product Disclosure Statement for any financial product you are considering and you should read this document carefully before acquiring any financial product. Why do share prices rise? In the short term share prices can fluctuate and sometimes it can be difficult to tell why. However, over the longer term, the share prices of businesses listed on the stock exchange generally rise because of prudent financial management by the directors of the company. When the company makes a profit, not all of it is distributed to investors as dividends. Part of the profit is usually retained by the company to re-invest back into the business, (for example to buy better technology in order to create a more efficient workplace, or to buy other businesses, or to break into new markets). If this is done well, the business will generate bigger profits than before. And, once again, part of these profits will be retained by the business, leading to greater profits again. So, over time, the value of the company increases and this is recognised by investors who buy more shares, thus increasing the share price. There are two main types of risk associated with shares – both of these can be managed. The first is that the price of a particular share can fall suddenly and dramatically, without much notice. This risk can be reduced by investing in a number of different shares so if one share does fail, the value of your overall portfolio should only be affected to a degree. This is known as diversification. The second risk is that the share market in general can experience fluctuating returns. While this can be nerve-racking, the share market has typically recovered its value over the medium term. Graph 1 shows the movements of the All Ordinaries index over the past 20 years and as you can see, although it has dropped at points – sometimes quite severely – in the long term growth is strong. It’s important to ride out any ups and downs and avoid panic-selling when the market is at its lowest point as this could mean you actually end up losing more money than if you’d waited for the value to rise again. 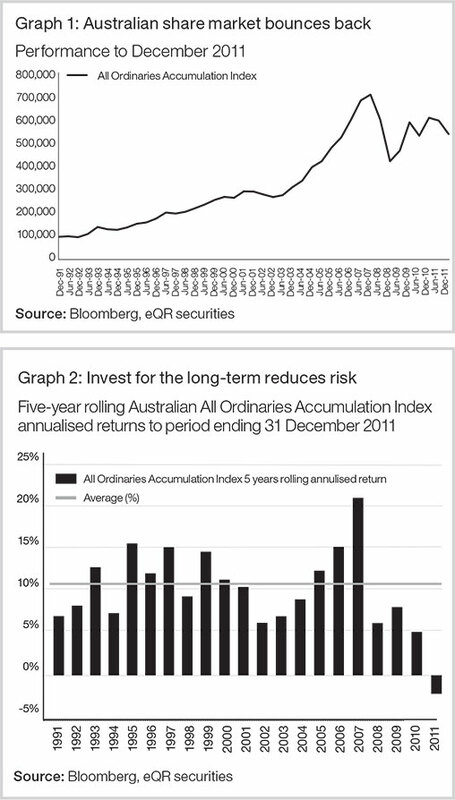 Graph 2 shows the percentage return of the All Ordinaries Accumulation Index over five-year periods. You’ll notice that the index delivered an average five‑year return of 10.27% to investors over the 20‑year period. Despite the risks involved, shares generally offer higher returns over the longer term than ‘low-risk’ asset classes. 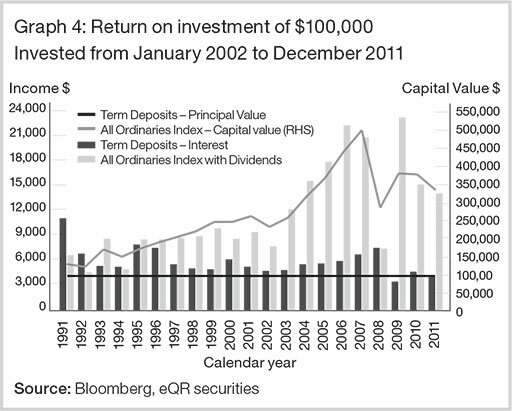 Graph 3 shows the difference in the long-term returns of investing in term deposits compared with industrial shares. As you can see, the income and capital value generated from the share portfolio vastly outperformed that of the term deposits.